A few months ago, at a car-boot sale in York, I stumbled on a very battered and dirty volume of the Yorkshire Archaeological Journal. I maybe paid 50p for it, if that. The reason I picked it up was, I saw it contained an article called ‘The Yorkshire Teazle-Growing Trade’, by R.A.McMillan. Teazles are something you see here in Yorkshire in hedgerows. I know that some ‘wild’ plants are escapee cultivars from old textile industries. R.A. McMillan illustrates the article with Walker’s “The Teasel Field” . I have seen (without closely looking at) this picture a million times. And there was something astounding I missed about it. The picture was drawn two or three fields away from the house where I grew up and lived til my nineteenth birthday. In the background, is my old village church and the churchyard where my grandparents and mum are buried. I have looked at that picture so often – but never noticed. Too busy looking at the costumes! So right under my nose, all these years, was a book showing home. Things I wrote about in ‘A Pink Dog Lead’ happened just out of sight in Walker’s Teasel Field picture; the other side of that church! Walker famously conflated things in his illustrations and the cottages pictured there do not exist but are probably transposed from a point on the other side, and actually out of view. The house I grew up in was a farmhouse, in 1814, and may well have been no stranger to the teazles. Some time ago a museum curator – who will remain nameless – mentioned to me that a very rare dye plant – I will not name – had been found growing wild – somewhere I will not name – in the West Riding. The last traces of a lost, medieval dye industry – still growing in the wild. As no-one wants it disturbed, it’s location remains A Secret. Years ago, when we lived in the West Midlands, we knew the roadside verges and abandoned cottage gardens where we could find weld, every year. So this is no surprise to me, that our hedgerows and wild places sometimes have escapees that hint of a lost world. I often find teazles in the hedgerow opposite my house, ten miles out of York. So have always been curious about them – but know very little. I thought I’d share with you my gleanings from the Yorkshire Archaeological Journal. Apparently, teazle growing was not very well documented, but it appears to have been a huge crop in Yorkshire – all three ridings. It was only introduced to the county some time in the 18thC as prior to that date it was commoner further South. Teazles were used to finish woollen cloth; the teazles were mounted in frames and when a nap was raised, highly skilled croppers like my dad’s Huddersfield-born ancestor, cropper Tom Lister, would crop the nap to finish woollen cloth. In fact it was a new kind of cropping frame that set off the Luddite rebellion. Suddenly, several croppers could be replaced by one not entirely efficient machine. “They previously wet the cloth thoroughly in a cistern of water, and comb the wool all one way with teazles, which are fixed for this purpose in a small wooden frame. Some of these are arranged on the floor….” [picture above]. “The place where teazles were first grown in Yorkshire was the village of Biggin, a few miles to the West of Selby…. By 1770… it had reached Stillingfleet”. In the 1770s, my mum’s ancestors all farmed or were farm labourers in Stillingfleet, and neighbouring Wistow, Ryther and Cawood. Ryther and Cawood are the next villages along from Biggin. If my dad’s ancestors in the West Riding wool trade used teazles to crop the cloth; mum’s ancestors near Selby may have grown teazles. I sit writing this somewhere in Stillingfleet parish and could probably, if I walked out now, find wild teazles growing in the hedgerow yards from my door. Apparently, the Vale of York’s heavy alluvial soil suited the crop. And the Vale’s proximity to Leeds, centre of England’s woollen trade, was another factor. Anyone familiar with this blog will know the Regency era writer/illustrator George Walker, whose ‘Costumes of Yorkshire’ (1814) is a frequent flyer. 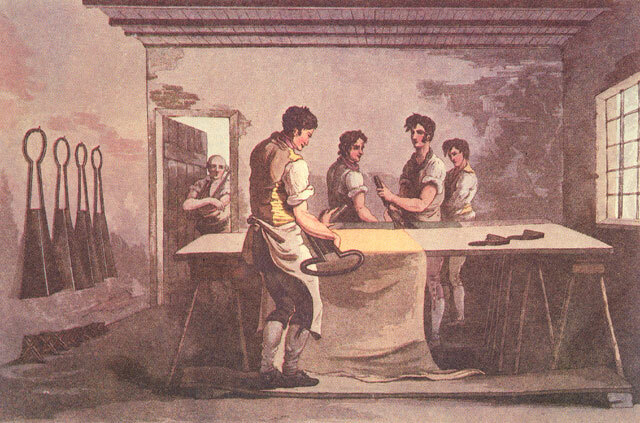 In 1813, Walker travelled the county, documenting the clothing of ordinary, working folk. Walker is so fascinating as he was documenting the costume of ordinary people at a time when no-one was much interested in this. I have often used Walker’s illustrations for my work. Incidentally, the Sherburner in his picture is wearing the universal rural working class woman’s uniform of the red cloak. See my Pinterest page here for more UK and US red cloaks. The Teasel, or Dipsacus sativua, is a plant much cultivated in the east part of the West Riding, though form the impoverishing nature of the crop, which requires two years to bring to maturity, it is seldom approved by the proprieter of the soil. It is however and article of essential importance to the Colthier, who uses the crooked awns of the heads of this plact for raising the nap of the cloth. In the autumn of the second year the heads of the plant are cut off, carefully dried, and after being fixed upon long sticks, are conveyed away for sale. Temporary sheds are usually erected in the teasel fields for the work-people employed, who not unfrequently form very interesting groups. In his 1822 Trade Directory, Baines wrote that teazle-growing was “almost peculiar” to the Barkston Ash wapentake (Sherburn in Elmet is part of this area; Biggin a neighbouring village). .
One reason Sherburn may have been the centre of teazle growing was that it was on the direct road to Leeds that became the old A1 – the primary route between Scotland and England. Teazles were needed by the croppers like Tom Lister – who had moved to Leeds by the mid 19thC. Although the 1850s saw my dad’s wool trade ancestors move from Huddersfield to Leeds, the same decade also saw a peak for the teazle trade; as machines evolved, the teazles could be replicated with machinery. Although there were still a handful of teazle growers in Sherburn by WWI. R.A.McMillan suggests that whilst it was handy for the West Riding wool industry to grow teazles closer to home, they could never quite produce enough to be self sufficient in them and still imported teazles from the older growing areas, down South, like Somerset, Gloucestershire and Worcestershire. The Selby/Vale of York area was also a centre of woad and madder production in the 19thC. These would also decline sharply after the introduction of aniline dyeing in the 1860s. Teazles were a biennial crop which made heavy demands on the soil and was labour-intensive to grow. They needed constant weeding but the farmer would see no return on the crop for 18 months after sowing. Like any crop, if there was damp weather during harvest the whole crop might rot away and be useless. Yet if the yield was high – prices would be lower. The fact it was high risk meant the teazle industry developed an unusual system, where the farmer would rent the land and a specialist teazle grower come in, and work the crop and bear the brunt of the risk. These were called “tazzle men”. The farmer would plough and prepare the land then the tazzle man take over. They would share the profits equally. Many tazzle men had other jobs. One Sherburn grower was a mole-catcher. . Others shop-keepers, butchers as well as farmers. Sometimes woad was grown between the teazles. (Madder was also often commonly sown with woad). Plants were so tall they hid the harvesters from sight; and were harvested often by casual labourers – women and men. 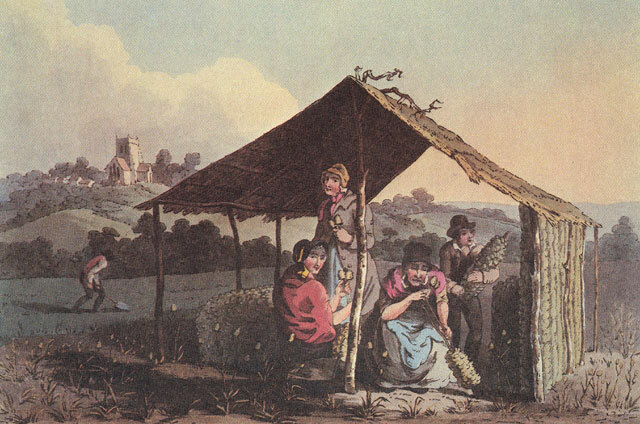 They were tied in bunches of around 50 and dried in temporary huts, like in Walker’s illustration. It’s interesting that the female labourers in Walker’s picture, are wearing blue (woad) and red (madder) dyed clothes, as both dyestuffs were grown amongst and alongside the teazles. Woollen cloth was often of a lower value than worsted, so it is possible the textiles they were wearing, were made from West Riding wool with a nap raised by Yorkshire teazles. Most of the Sherburn teazles went straight to Leeds. According to McMillan, Leeds was “the chief finishing centre serving the West Riding woollen industry” . Carting teazles to be sold was such a regular thing, that the “frequency with which the various routed were travelled can be seen from the fact that… the horses knew by themselves which pubs to stop at on the way. This was sometimes a source of embarrassment when the boss decided to come along on the trip” . I know the very field where Walker must have stood to do this illustration. Promise I will go there soon and see if we can find any teazles in the hedgerows. The Yorkshire Archaeological Journal, Vol 56, 1984, ‘The Yorkshire Teazle-Growing Trade’, R.A.McMillanp 155 ff. I’m a bit late joining this thread. I live in the North East of Scotland and work for The National Trust for Scotland. We are developing the herb section of Pitmedden Garden which includes some teasels so I was doing a bit of research and came across your fascinating article. Just for interest, Johnson’s of Elgin who make fine cashmere clothing still use teasels to brush their very best articles. I am not sure where they source the teasels. Did you find any teazles? I’ve just bought a copy of this Walker print and when I did a Google search, I came across your fascinating article. Yes, we found teasles very close to the spot where Walker must have stood! I really enjoyed reading this article. My 5x and 6x grandfathers on my father’s side were teazle growers around Sherburn-in-Elmet and Barkston in the late 18th and early 19th century, and are buried in Sherburn churchyard. They were Richard & John Wrightson. John was Richard’s son but he pre-deceased his father. Richard died in 1846. I live in the south midlands these days but get up to Sherburn and York occasionally. Teazles were grown down here in Somerset too, and like you we still find them popping up in the hedgerows. The other fun one we have in the south west is hemp, which was grown for the ropemaking industry. Just occasionally one appears in the places where rope was made, especially in the woods up above some of the Cornish fishing towns. Of course it’s possible that those are planted deliberately in the hope that they won’t be noticed. Here in suburban York, heading towards Selby, teazles pop up when they are allowed to: in the uncultivated bits near schools and shops, on the edges of so-called nature reserves, near the river and the cycle paths, familiar to dogwalkers, cyclists, runners and anyone taking an unhurried route to work or school. We have made hedgehogs for the nature table from them. We have tried to card wool with them. (It works a bit, but I see what you mean on an industrial scale.) What I adore is that they last so long, well into spring and summer if not harvested. They seem to know that they have a purpose and so make themselves durable. Thanks for a fascinating article – I love the illustrations from Walker’s Costumes of Yorkshire. But the fuller’s teasels used in making cloth have little hooks on the ends of the spikes. They are a cultivated subspecies of the wild teasel. (See e.g. http://archive.bsbi.org.uk/Proc7p377.pdf) Naming is very confusing, though, as the Latin name for the wild teasel (with straight spikes ) is Dispsacus fullonum, i.e.. fuller’s teasel. I’ve been told that teasels are still used for carding by a firm in Cleckheaton, but they import their teasels from Spain. Thanks for clarifying, Barbara. Must confess I thought there was only one kind of teazle, so now I know otherwise, will go and see if any are still in the hedgerows round here, and if so pin down which sort they are. My mum was a keen flower arranger so I was thinking maybe some of the ones we see are garden escapes from 1950s’ flower arrangers. ;o) We will try and get across to Sherburn next week or so, and see if we can find owt. A lot of the verges have been cut now, so we might not be lucky… And I still need to fiund out more and clarify about the distinction between fulling and some form of carding/wool prep. How very interesting and how delighted you must have been to have found an illustration of where your ancestors lived and worked. I remember teasels growing in the hedgerows from my childhood in England, we would play with them as children. On my return visits back home I see that The National Trust uses a strategically placed teazle or two or stop weary tourists from sitting on the occasional 16th century hand embroidered chair! Thank you for a fascinating read. Hi Lydia – Yes, the artfully placed teazle could be very handy when we’re doing living history displays! Absolutely fascinating, thank you for sharing all this. Incidentally, in the small promotional pamphlets produced occasionally by Patons and Baldwins in the 1950/60s the use of teasels is recommended to produce a home made ‘brushed’ effect on garments! Hi Jane – I will have to look out for that! I have quite a few old editions of Patons’ Woolcraft – I wonder if it’s in there, as well? I remember being told as a kid at school that teazles were used by the Romans to ‘card’ wool. Have been assuming that was wrong, but maybe not.